Hikari Spirulina has proven to be an outstanding color enhancing food because of the combination of pure cultured Spirulina plus the conventional characteristics of carotenoid NS germ. It will help your koi develop championship form with regular use. Hikari Spirulina will help bring out the most vibrant colors your koi can muster without affecting the white skin of their body. Expect a beauty and luster not available with most other koi diets! Hikari Spirulina is a floating type food that will not cloud the water. High in stabilized vitamin C, Hikari Spirulina promotes resistance to stress and immunity to infectious disease. 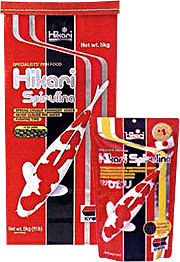 The manufacturing technique used to produce Hikari Spirulina has been developed from over a century of koi breeding and showing experience. If you’re looking for championship koi, make Hikari Spirulina part of your koi’s regular diet. When pond water is consistently above 22C(70F), feed 2 to 4 times daily. Please do not feed more than your fish will eat within 3 to 5 minutes, removing any uneaten food after feeding period expires. White fish meal, wheat flour, wheat-germ meal, brewers’ dried yeast, soybean meal, spirulina, dehydrated alfalfa meal, vitamin A, vitamin D3, vitamin E, vitamin K3, vitamin B12, L-ascorbyl-2-polyphosphate(stabilized vitamin C), magnesium carbonate, manganese sulfate, calcium iodate.